Wasn’t it just yesterday, that we were talking about Thanksgiving?! Now we’re amid Hanukkah, and Christmas is around the corner! I try to avoid the mall this time of year because just trying to find a parking spot is painful and I also prefer to support local, small businesses as much as I can. But due to my procrastination this year, Amazon Prime might be my saving grace for the last minute random items I can’t find in Albany. 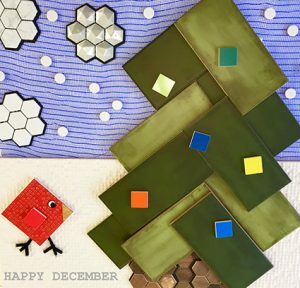 This month’s tile palette (shown left) is inspired by the winter landscape in Upstate NY. The fallen leaves and grass are covered by a blanket of white snow; it brings life and sparkle to the otherwise bare branches of deciduous trees. This is the season for pine trees, their green needles pop against the white snow and when the snow becomes heavy, they morph into something from a Dr. Seuss book. This type of snow is the best because it’s perfect packing snow for building snowmen, snow forts, and snowball fights. For those days that get too cold outside, here’s a fun activity to do inside and (maybe) get a jump on presents for next year?! 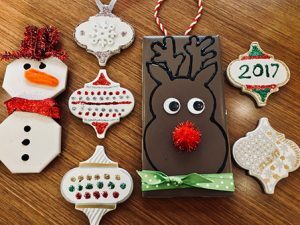 My coworkers and I at Creative Materials, created tile ornaments with pieces of mosaics, ribbon and glitter glue. They are pretty darn awesome! Great job Creative coworkers!